Ishmeet Singh’s body was brought home amid the chants of “Waheguru” here this afternoon. When the van carrying his body, escorted by his father, relatives and friends, entered the street near his house, neighbours broke down. Women were seen running along the van, crying bitterly. His shattered father, Gurpinder Singh Sodhi, walked ahead of his son’s body when it was taken inside the house. A proud father had suddenly aged. 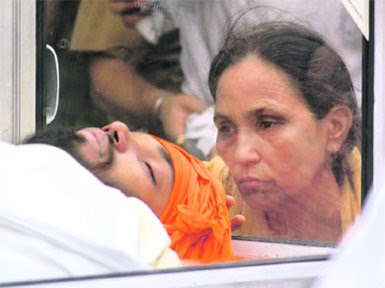 His mother, Amritpal Kaur, sat next to the body. She uncovered Ishmeet’s face and kissed him before breaking down. She had not cried for the past two days, leaving the family worried. As the family grieved, those witnessing the scene could not control their emotions. It seemed the tragedy had struck not only Ishmeet’s family, but also those present there. Later, the body was kept outside in a glass chamber. The head was covered with a saffron cloth. People who loved him queued up in the sultry weather to have a last glimpse of Ishmeet, whom they had once cheered to victory. Several elderly people, who had trouble walking, waited patiently for their turn to see him once more. “Ishmeet’s family members are not alone in their grief. We are with them. We all have lost a promising and talented son,” said Narinder Kaur (70) from Dugri, while summing up the sentiments of scores of Ludhianvis. Now we have a murder conspiracy suggested by Ishmeet's family members. I wonder what will be the outcome. i still remember that day when i cried for your victory simple because we shared a lot in common... They were tears of joy.